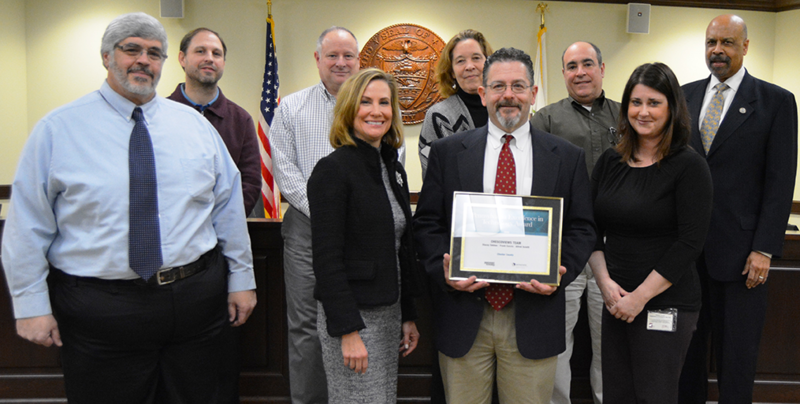 This week, the Chester County Commissioners recognized members of the Geographic Information System (GIS) staff from the County’s Department of Computing and Information Services. The GIS staff members were recently presented with the Pennsylvania Excellence in Technology Award at the PA Digital Summit in Harrisburg for the creation of ChescoViews - an easy to use, online system that provides free GIS and land records information including all of Chester County’s roads, municipal boundaries, zip code boundaries, school districts and flood plains. Pictured: Commissioners’ Chair Michelle Kichline and Glenn Angstadt, Chester County Chief Information Officer (center left and right),(left to right, front row) Alfred Sciotti, Jr. and Stacey Sekkes, and (left to right, back row) Mike Volz, Brad Koren, Amy Rumford, Frank Coccia and Chester County Commissioner Terence Farrell. not pictured: Peter Xu.